If you are going to keep pigeons healthy, you need to keep the loft dry. We had a very wet spring and as a result my young bird mortality was significantly up. We had several 10-day periods where the sun was never seen. It was wet. Something that I have used in my loft designs is wire floors. If you have a holding pen, say for a few hundred feral birds, this may not be possible. A friend of mine purchases a few hundred ferals at a time and was having some mortality problems. His pen was an 8' x 8' walk-in enclosure located inside a barn. He has now placed the pen outside, with a roof overhead and a gravel floor. He says hardly a bird has died since then - remarkable considering that wild birds can bring in all sorts of disease. Try to locate the pen in a sunny part of the yard. 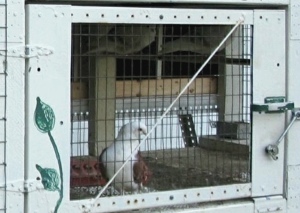 Heat will not hurt the pigeons - think how hot it must be in the rafters of the typical barn where they may be found. The natural nesting place for pigeons is a rocky cliff - no shade - and hot. You may wish to provide protection from winter winds - more if you are in the far north - but make sure the loft has sun from the east and south if possible. In the humid south we use a very open pen design. Elsewhere in the country a more closed design works great. Many garden sheds have been converted to pigeon coops. Another factor in pen placement is privacy. In these days of animal rights activists and zealous zoning authorities, some discretion is a must. I actually built one pen into some bushes, but found that the lack of sun and air circulation was not so good for the birds. Placement away from the roads and behind sheds or kennels is a good thing. And being considerate of your neighbors is not a bad idea as well. For instance, it might not be a good idea to place the flight pen near your neigbors yard if he has sheds or other objects that the returning birds might perch on. The neighbors may enjoy watching your birds (mine puts out bread at their feeder for the pigeons) but they might not like them perching and pooping on their garden shed, so keep that in mind. I've started painting all my pens in camo colors - including the roofs. I'll be interested to see the next run of aerial photographs on the county GIS site to see if they are visible. Its kind of a nice hunting motif anyway. If you are in a less rural situation, you may want to make the pens look nice - like a fancy garden shed. Google "pigeon loft design" and look at the nice structures that many hobbyists have built - these would not look out of place in any neighborhood. If you are managing your pens correctly, the smells and flies should not be a problem. If you are using wire, allow the manure to pile up under the pen during the warm months - it will compost in place. If you dig it up, expect a horde of flies in the coming days. 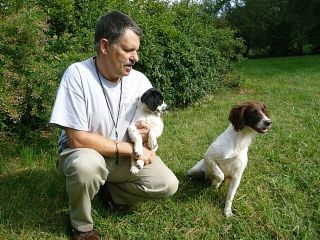 In the last issue, I talked about the four step program: breeding pen, juvenile pen, return pen and cull pen. 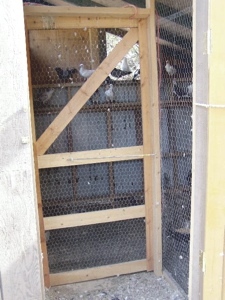 The requirements for a juvenile pen or a cull pen (also a holding pen for ferals or clips) are the simplest. There does not seem to be any specific design for such pens, but rather some helpful guidelines to think about. I generally use salvage wood and metal from construction sites or projects, which I collect and save for future pens. As such, the dimensions are governed by the wood or roofing material on hand. The pen pictured here cost me about $10 - I needed to buy the hardware cloth for the floor. Most important is a good door. You will need to be able to reach into all corners of the pen in order to catch birds. Nothing is more frustrating than to have a bird 6" out of reach. I generally try to make the door about 2' square. I weld mine out of scrap angle and expect the door to outlast the pen. Keep sharp wire edges away from the edge of the door, so you don't cut yourself every time you retrieve birds. A good latch is also important. If you have raccoons about, you may have to take extra steps to make it secure. You may want to double-latch the door. I have two pens with self closing latches that came off some old metal cabinets. Nice - you just push the door shut. Recently I've been using modified window latches which closes easily with one hand. The funny thing about homers is that when you do forget to fully latch the door, you can just leave it open and hopefully they will all be back by evening. Once a well-meaning neighbor kid, presumably after watching "Free Willy", came and liberated my homers. I never laughed so hard. It would not have been funny if it were a pen full of ferals. In a holding pen, I like to give the birds some dry attic space for roosting. A flat board about 6" wide will do the trick. This gives the birds a place to get out of cold winter winds and driving rainstorms. In really rough winter weather, I will hang a sheet of plexiglass or metal on some sides, or staple clear plastic over most of the wire sides. The wire floor still allows for circulation. A vent at the top of the roof may also help with circulation and will keep the attic air from cooking the birds. This pen has an attic solarium with plexiglass sides facing the south. Note the ridge vent and also note the sides are spaced about 1" from the wood frame. This gives the birds a dry and sunny place to hang out during the winter months. 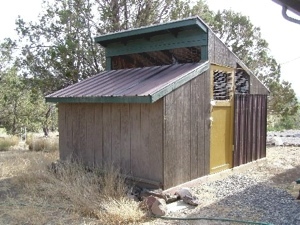 Larger walk-in pens for holding ferals generally use a shed design. A gravel floor is helpful. I've seen simple chicken wire pens made with tall fence-posts (Botti), a converted chain-link dog kennel with a chicken-wire roof (Wallace) and the Taj-mahal of holding pens, a small barn with a chicken wire side wall on one side (Wilson). A small pen with a wire floor is probably the way to go for holding culls or for juvenile birds. If you are dealing in larger quantities of ferals, a walk in shed might be the ticket. This issue's "coop de jour" was sent in by Jacki Dapkus of Cedaridge, Colorado. As with our last coop de jour submission, this coop is located in an arid region with moderate temps (climate). Jacki's coop illustrates the principle that you can never build them big enough. 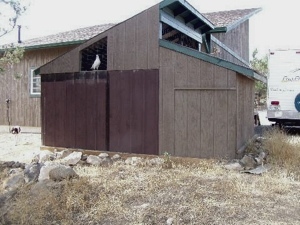 The smaller shed section is the original coop. Note the ventilation above the old section - good airflow is always a good feature. This design also features a small "air-lock" to prevent losing birds when entering. A nice feature for a holding pen with ferals; less necessary for homers (they usually come back). As with our last coop de jour submission, this coop is located in an arid region with moderate temps.